We welcome you to visit us at any of the events we take part in throughout the year. Last weekend we attended the Stratford Upon Avon Home and Garden Show, enjoying the weather and meeting some great people. The show took place in the Recreation Ground, the centre of the town and on the banks of the beautiful River Avon. The annual event was particularly special as 2016 also celebrates the 400th anniversary of William Shakespeare, so thanks to everyone who saw us there. 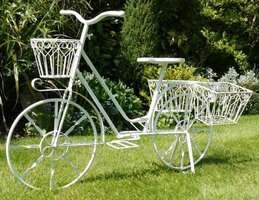 Perhaps you're looking for some Garden Accessories, or you're heard about our best selling Metal Wall Art? Display some creative colourful pieces throughout your home today. The Canwell Show, Canwell, Near Sutton Coldfield. One of the largest one day agricultural shows in the Midlands. Events are great if you're looking for a fun day out, whether on your own or with the family. If you would like to find out more about any of our products, or simply view our range in person, please feel free to visit us and discuss your requirements. Whether you're redecorating or locating the perfect gift for someone, we can help!